We are a quality conscious organization certified by ISO 9001:2008 committed to offer unmatched range of PP Fabrics, PP/HDPE Woven Bags/Sacks (Small Bags), FIBC Fabrics and Bags (Jumbo Bags) to our clients. Our range is designed using premium quality raw materials and in accordance with international standards and norms. We have a team of high experienced quality experts who keep close eye on the each activity of our organization. Moreover, these experts test our range on the various parameters to assure its durability and strength. Being a client centric organization, we offer a superior range of PP Fabrics, PP/HDPE Woven Bags/Sacks (Small Bags), FIBC Fabrics and Bags (Jumbo Bags) to our clients at industry leading prices. Our range is provided in various specifications, which an also be customized as per the requirement of pour clients. In order to make a hassle free transaction with us, we facilitate our clients with easy modes of payment such as DD, cheque and cash, online and credit card. 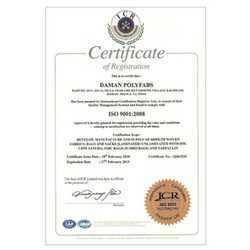 Moreover, by offering quality products to our clients, we have received an ISO 9001:2008 certification.